<a href=http://www.bitsmack.com/modules.php?op=modload&name=Comics&file=index&action=comic&id=281>Today’s comic</a> is based on a conversation K-Dog and I had. 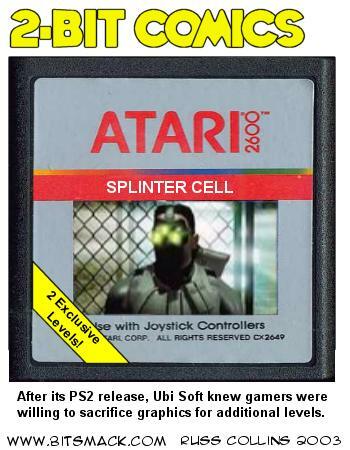 He said he would rather get Splinter Cell for PS2 because it has an additional level. I said I would rather get the XBOX version because the graphics are better and Splinter Cell is known for its incredible lighting effects. Don’t get me wrong, I don’t think graphics are more important than gameplay. But, when it comes to a game that is recognized for its graphics, that’s more important to me than an extra level. In other news, my drum controller came for Taiko no Tatsujin. I am impressed with how well it is made. It is actually as loud as a drum when you play. I’ll put up my full review of the game soon.